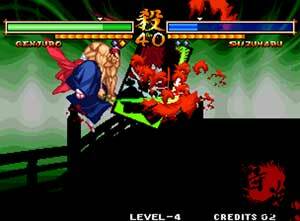 STORY: It is the way that requires one to become a demon: To slash at God and raise a weapon toward Buddha, to turn one's back to Heaven and carve your own destiny. To sever all ties to virtue and embrace destruction. To cut off all obligations and plunge into mayhem. 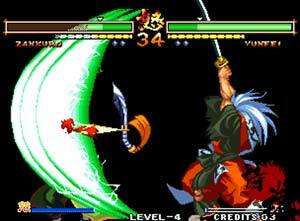 When the ordained meeting of 28 fierce warriors begins, all that will ensue are a series of duels to the death. These individuals entrust their fates to their skill and their weapons. For those who cannot gain mastery over technique, death is the only just desert. For those not up to the task of seizing destiny by the throat, a cherished end in battle is their only hope. There is no need to pontificate over such a merciless existence. 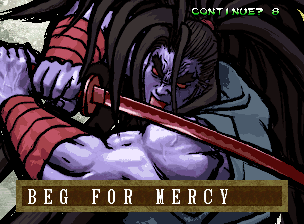 Sacrificing your life on the path to mastery itself, this is the only way of death honored by those of all ages. En garde! Your destiny is now to be decided! 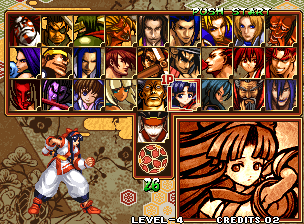 A much improved selection screen over SS5. 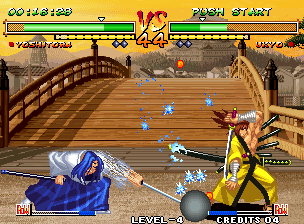 REVIEW: The ninth installment to the Samurai Shodown series, Samurai Shodown 5 Special is an enhancement of Samurai Shodown 5 featuring new character artwork, new stages, playable bosses (including Amakusa & Mizuki), and tweaked gameplay. 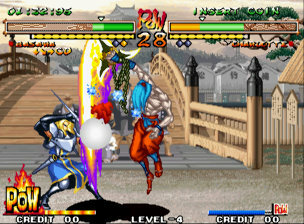 The home version (AES) of Samurai Shodown V Special suffered a rocky launch, but the arcade version remedied some isses and added "Overkill" moves - a fatal strike unique to each character. 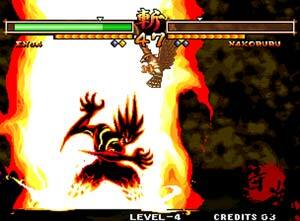 New to the single-player experience are brand new mid-bosses added to the mix. 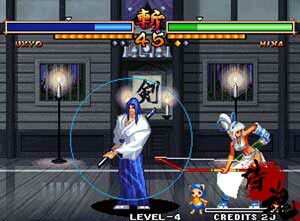 Sankuro and Yumeji from the prequel were taken out and replaced with Amakusa and Zankuro. 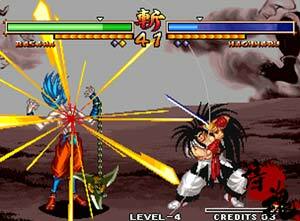 Not to mention, the return of fatalities, which were sadly missing in SS5. 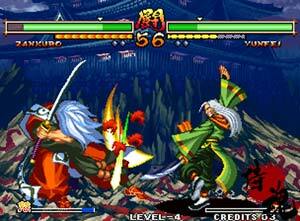 Samurai Shodown 5 Special features several visual alterations over the prequel. 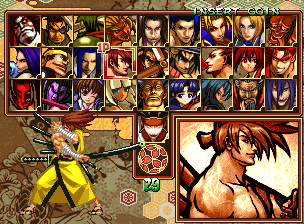 The selection & VS screen character artwork has a "darker" look to it which reminds me a lot of Samurai Shodown III. 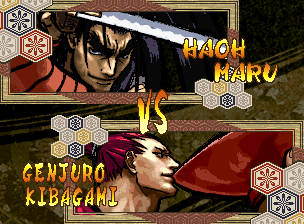 Of course the character sprites and voice-acting are borrowed from the prequels, dating back to the likes of Samurai Shodown III. 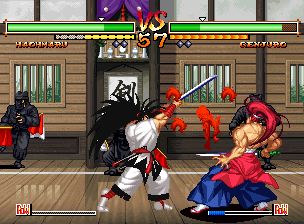 No doubt the game has a dated look, but the cool new backgrounds, music and artwork give the game a fresh vibe from the start. 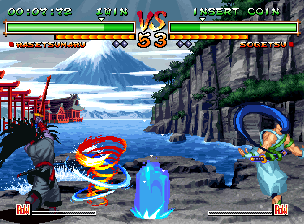 One of the coolest new stages. 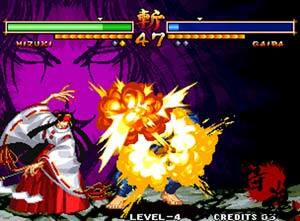 Samurai Shodown V Special adds several gameplay tweaks over the prequels. 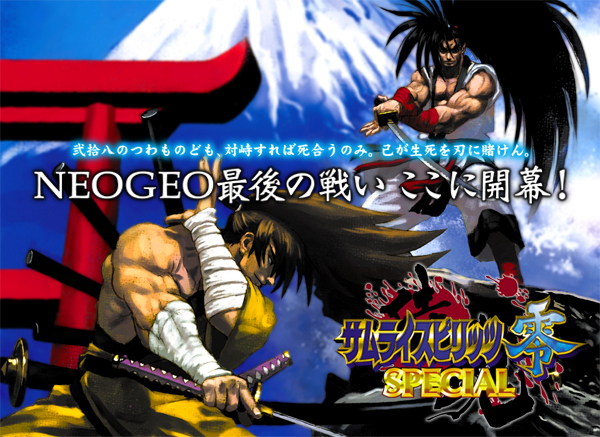 Mechanics in SSV Special, include: Sword Gauge, Rage Gauge, Weapon Flipping Attack, Concentration One, and Overkill Moves. 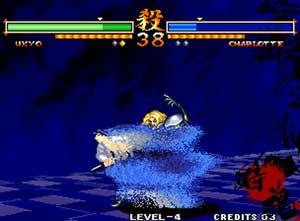 The Sword Gauge affects damage output. 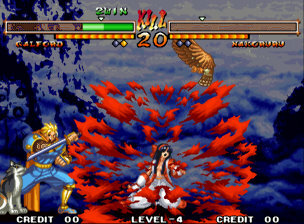 All attacks performed reduce the meter and the amount of damage they dish out. The gauge slowly regenerates when not attacking. 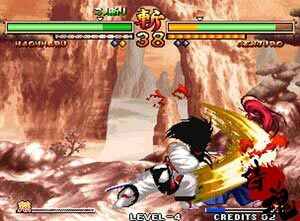 The Rage Gauge functions the same way as in previous titles, and Rage Explosions can be executed which will push opponents back and open up other opportunities of attack. 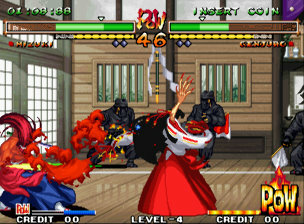 The character specific "Overkill" fatalities have the goriest outcomes in the series to date, most of which extracting tons of blood from the victim and leaving them in several pieces. 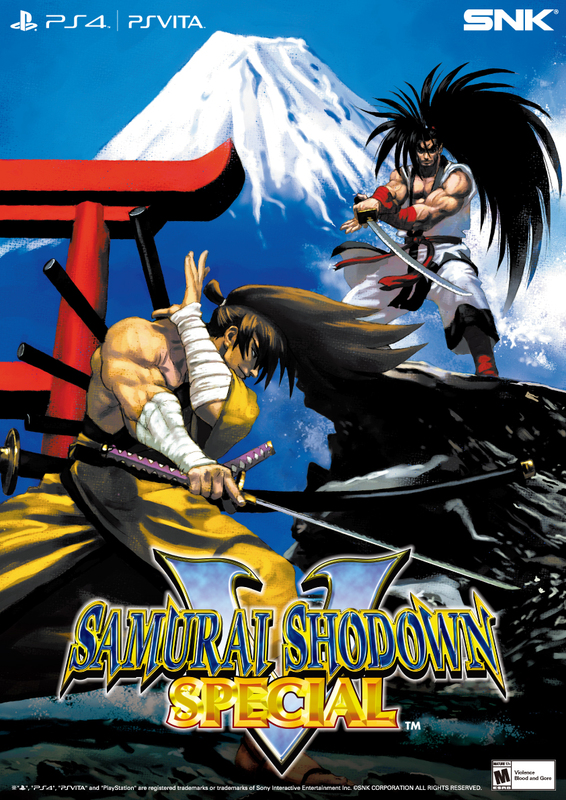 These Fatalities are a controversial new direction for the series, seemingly going for "shock value" over artistry... in other words, it's better suited for a game like Mortal Kombat, but you could make a case that it works for Samurai Shodown as well. In any case, some of the Overkills are a bit silly and/or poorly animated, but most don't fail to entertain at the very least. 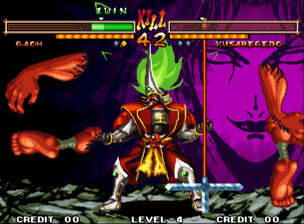 In addition to the Overkill moves, classic "horizontal" fatalities make their return, along with all new Fatalities (such as being split in half vertically). 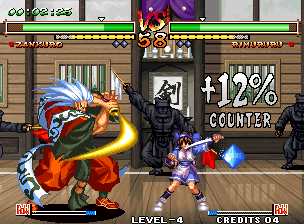 Nakoruru and Rimururu, once immune to fatalities (in SS4), are also now susceptible to fatalities. 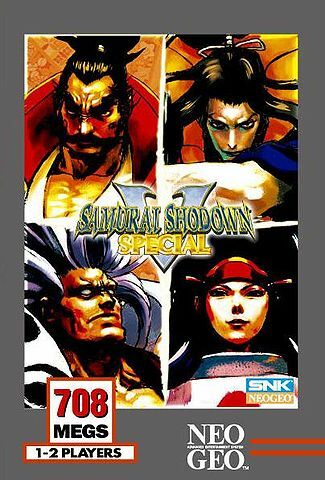 While Samurai Shodown V Special offers one of the largest and arguably most balanced rosters in series history, one can't argue that the sequel looks like a "mash-up" of several previous installments of the series. 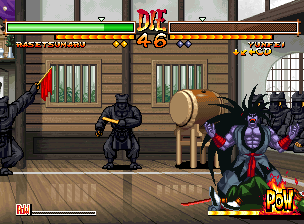 Some returning character sprites are still missing animations from earlier installments, and (in my opinion), most of the stages lack personality and excitement this time around. 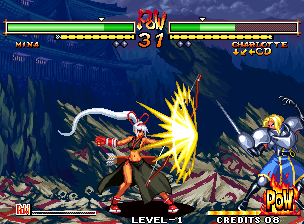 However, there are some significant "artistic improvements" over SSV, including a new style of character artwork and a much more stylish character selection screen. 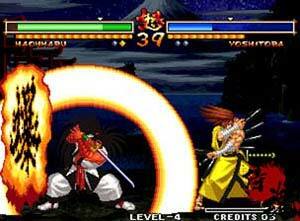 The new gameplay elements also provide the game with a fresh vibe and visual appearance when in motion. 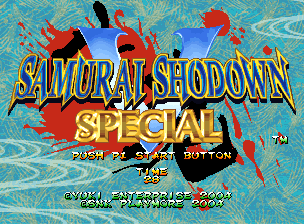 Of the flipside, I think they took the "gore" a bit too far in SSV Special. 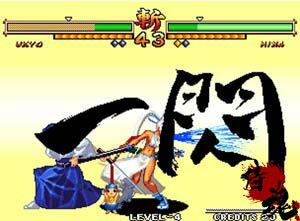 Going for shock value has worked for games in the past like Mortal Kombat, but I always appreciated the Samurai Shodown series for doing fatalities in a classy / respectably censored way... up until SSV Special, at least.